MODA Floors & Interiors is transforming its 10,000-square-foot showroom to become the design destination for high touchpoint clients and design professionals in the area. 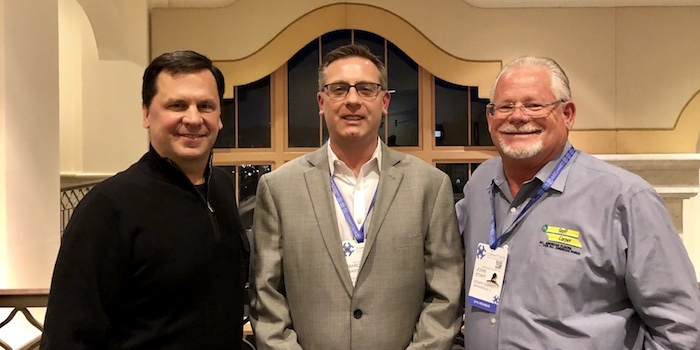 John Staff, Staff Carpet; Marc Martorano, Avalon; and Dean Howell, MODA Floors & Interiors, sat down with "Floor Covering Weekly" for an exclusive roundtable discussion at Shaw Floors' Commit 2019 to discuss pain points and opportunities for today’s retailer. For the sixth consecutive year, MODA Floors & Interiors partnered with Agape Youth & Family Center, a non-profit organization. Amp up your bathroom’s comfort level by adding heated towel racks, in-floor radiant heating, and stylish accessories. Different flooring trends that bring style and function to any space. Dean Howell of MODA Floors & Interiors offers some suggestions for this HGTV photo gallery. An area rug can add comfort, color and definition to your interiors, says Leslie Waller of MODA Floors & Interiors. Read more in Atlanta Journal/Constitution.. When many of our clients think about vinyl flooring, it brings back images of their mother's inexpensive linoleum or vinyl floors. That is not the case anymore. The newest generation of vinyl products are now referred to as Luxury Vinyl. This product category has experienced explosive growth and is currently the fastest-growing flooring product in our industry. Read more in Atlanta Home Improvement magazine.. The American design community and hardwood professionals alike are embracing the introduction of European-inspired, hard-wax-oiled hardwood floors in the United States. Learn more about the benefits of these types of floors here. "The rectilinear format is dominating the flooring industry today," says Theresa Minkoff, interior designer and project consultant with MODA Floors & Interiors. "This rectangular shape with [distinctive lines] can be found in porcelain tile and stone, luxury vinyl tile, rubber flooring and commercial carpet, and is usually in size formats of 12 inches by 24 inches or larger." Read more of this Atlanta Home Improvement magazine story..
MODA Floors & Interiors and Agape Youth & Family Center, a non-profit organization, continued their "Extreme Bedroom Makeover" partnership this year. During the one-day event, MODA team members remodeled two bedrooms for four children in the Bolton Road community in Northwest Atlanta. MODA Project Consultant Offers Advice in "Atlanta Home Improvement"
"Hardwoods may be thought of as more popular today, but it has been the first choice of flooring for over 100 years," says Jerry Park of MODA Floors & Interiors. "Hardwood floors provide an innate beauty with lasting durability. And not only is wood durable enough to last for generations, but it also can incorporate the green label as it applies to sustainability and environmental stewardship." MODA Floors & Interiors and MOSAIC Group [Architects and Remodelers] are serving as drop-off points for Agape Youth & Family Center's annual campaign to collect and distribute 1,500 backpacks filled with school supplies for children of all ages in economically challenged neighborhoods. The drive runs through July 22. For the fourth consecutive year, MODA Floors & Interiors and Agape Youth and Family Center, a non-profit organization, continued their "Extreme Bedroom Makeover" partnership. During the one-day event, MODA team members remodeled two bedrooms for three boys in the Bolton Road community in Northwest Atlanta. Dean Howell, president of MODA Floors & Interiors, is quoted in the July issue of Floor Trends. With more than six million users, sites such as Hometalk provide retailers with a free vehicle to help market themselves to existing and potential clients. MODA Floors & Interiors, a flooring and window coverings resource and Atlanta's first Shaw Design Center, recently celebrated its 10th year in business. The company has showrooms in the West Midtown Design District and at Town Brookhaven. Dave Foster of TalkFloor.com interviews Dean Howell on MODA Floors & Interiors, his philosophy and his approach to doing business. For the third consecutive year, MODA Floors & Interiors and Agape Community Center, a non-profit organization, continued their "Extreme Bedroom Makeover" partnership. During the one-day event, MODA team members remodeled a bedroom for eight children in the Bolton Road community in Northwest Atlanta. Hardwood floors can add warmth, style and value to your home. Occasionally, however, they need a touch-up to retain their beauty. In this article from the Atlanta Journal/Constitution, Janice Howell of MODA Floors & Interiors provides some maintenance tips. MODA Floors & Interiors is serving as a drop-off point for the Agape Community Center's annual campaign to collect and distribute 1,000 backpacks filled with school supplies for children of all ages in economically challenged neighborhoods. The drive runs through July 25. MRemodeling, along with team members MODA Floors & Interiors and Recentered Pieces, recently won a National Contractor of the Year Award (CotY) for Residential Interior Element. The award is sponsored annually by the National Association of the Remodeling Industry. Can you make your hardwoods look as good as they once did? Check out MODA's response in the April 2013 issue of Atlanta Home Improvement magazine. Click to read the Q&A. Except in cases of severe damage, hardwood floors can be sanded and refinished rather than replaced, not just once but multiple times over the years. Janice Howell of MODA Floors & Interiors discusses the process in this article from Atlanta Home Improvement magazine. MODA Floors & Interiors has received two awards from the Atlanta Chapter of the National Association of the Remodeling Industry. NARI is the only trade association dedicated solely to the remodeling industry. MODA is a flooring and window coverings resource with an 18,000-square-foot showroom in the West Midtown Design District. Think cork is a relatively new flooring option? Think again. In this article from Atlanta Home Improvement, Janice Howell discusses why cork is one of nature's best building materials. Janice Howell of MODA Floors & Interiors suggests some ways window treatments can change the look and feel of a room. The article appeared in the Atlanta Journal/Constitution HomeFinder section. Dean Howell offers some tips on refinishing your hardwood floors in this Atlanta Journal/Constitution article. Ceilings and floors may not be the first thing homeowners consider when they're plotting a remodeling job or building a new home, but experts like MODA's Dean Howell say an innovative approach to either the top or bottom of your home can be a great way to refresh an existing house or create a cohesive, visually engaging look. Click here to read the Atlanta Journal/Constitution article. Area rugs need the same attention and consistent maintenance as your carpeting, ceramic tile or hardwood floors. Knowing what's expected of you regarding their upkeep can be a determining factor in the type of rugs you purchase. Janice Howell of MODA Floors & Interiors offers tips on caring for your area rugs. Time, traffic, stains and spills will take their toll on your hardwood floor. MODA Floors & Interiors' Janice Howell sheds light on caring for your hardwoods in this November 2011 article in Atlanta Home Improvement magazine. Janice Howell of MODA Floors & Interiors discusses some of the issues you need to consider when selecting window treatments for your home. Click here to read the article, which appeared in the HomeFinder section of the Atlanta Journal/Constitution. Dean Howell of MODA Floors & Interiors was interviewed for the September 2011 issue of Atlanta INtown. "Five years ago, homeowners were conservative about colors and styles because they were remodeling to sell, but now people are fixing (their home) the way they want it," Howell says. Dean Howell of MODA Floors & Interiors is quoted in the August 2011 issue of Atlanta Home Improvement magazine. Click here to read "Fabulously Floored." MODA Floors & Interiors served as a Signature Sponsor for the 2nd Annual Agape Bedroom Makeover project. The Agape Community Center, a non-profit organization, provides a variety of programs and services for residents of the Bolton Road community in Northwest Atlanta. "I had a wonderful experience with Moda Floors and would recommend them to all of my friends. They installed new tile flooring in my kitchen, hallways and front foyer...."
At Moda Floors & Interiors, we're committed to staying a step ahead in design and product innovation. That's why we carry a wide array of tile, hardwood, carpeting and eco-friendly flooring options to fit every lifestyle and design aesthetic. Moda Floors & Interiors was founded in 2003 by Dean and Janice Howell. Moda Floors & Interiors has provided design and installation services to a wide array of commercial clients from retail stores to corporate offices to government organizations. We understand the fast-paced nature of commercial projects and are committed to staying a step ahead in design, installation and service.